As I have been working on finishing my master’s program (I graduate on Tuesday! 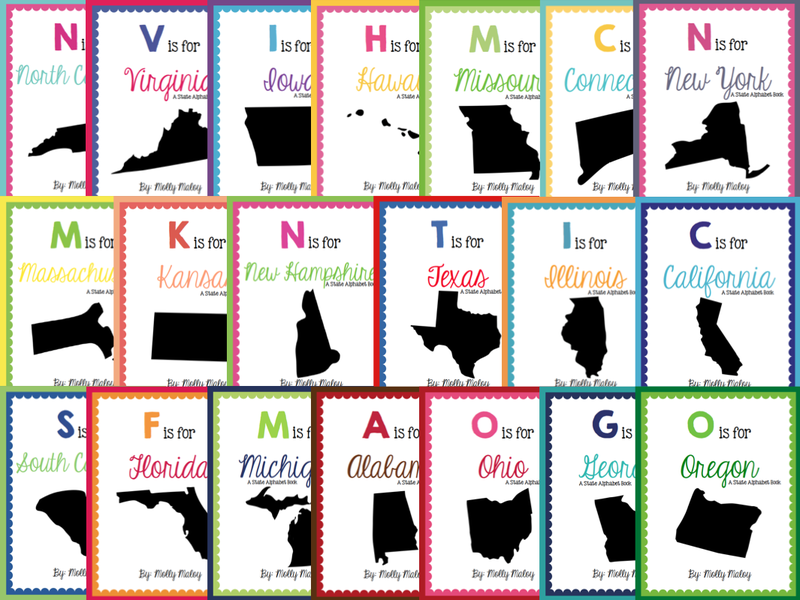 ), I have also been making state alphabet books! This is an activity that I do at the end of the year with my students since we spend the whole year learning about our state’s history! For each state book I included an A-Z sheet so students can write down different things that they learn about the state throughout the year. For example, after we learn about California’s regions, students will write down the regions on their A-Z list. By the end of the year they should have their A-Z list filled up with lots of idea that they can use when they make their alphabet book! For the smaller books there are two different cover options. Pages are meant to be cut into fourths so students can make their own individual books! Here are couple of pictures from the pages of the C is for California books that my students made this year! So far I’ve made books for 20 of the states, and I plan on making books for the rest of them in the next week or so! If you don’t see your state, let me know and I will get started on the requested states first! You can see the books I’ve made so far here! Such a cute idea! Congratulations on graduation! These are amazing! Congratulations on graduation. That is awesome! Love these books. I already messaged you over on TpT about wanting the book for Nevada. Thanks for sharing. This is exactly what I need I would love to have Maryland! Thanks! Such a great idea! I LOVE them! I will share this with our 4th grade teachers. They do a comprehensive unit on the states. Thanks for sharing! This is such a great idea! I love when this kids make their own books for their own classmates to read! These are even better because of all the research that goes into them! Oh! This awesome. I love your California one!